And here we are, another installment of my BABOR review series! This has been my year of making a concerted effort towards wearing Sun Spray Lotion daily. I used to despise it for two reasons. I was under the impression that it would make my skin oily. And I hated that SPF scent on my face. 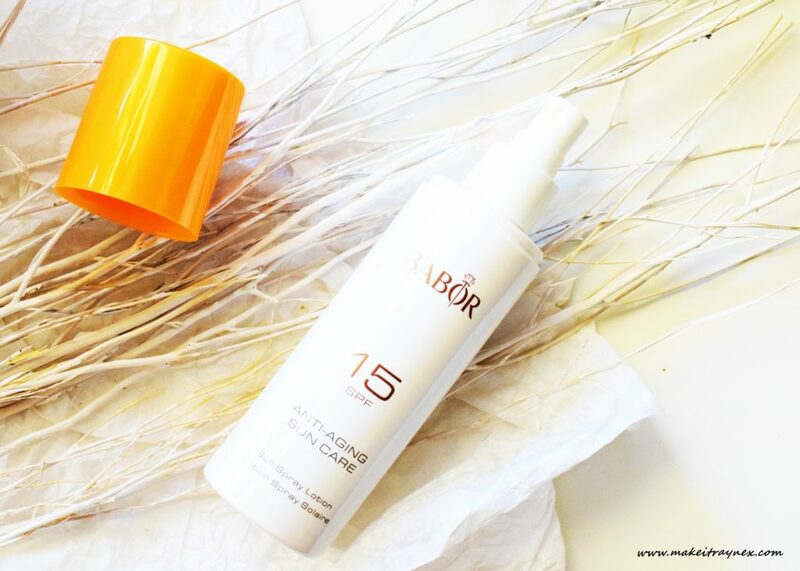 This BABOR suncreen however contains a light fresh scent, barely any trace of old school SPF. It does not contain zinc which means there is no trace of white left behind on your skin. And, being superficial, if this left any white residue behind I would not wear it under my make-up. There is a list as long as my arm of all the nasties that this sunscreen does not contain. However, I am keeping my review superficial and letting you know that it does the simple things I need from a face Sun Spray Lotion. It applies tacky-ish but that disappears after only a few minutes. There is no feeling of tightness. The SPF 15 does not sting your eyes. And there is no residue or scent. See my previous review on the Anti Age Collagen Booster Fluids here. And keep posted for more mini BABOR reviews over the next few weeks!